Incremental expansion at Petronet LNG’s Dahej terminal to 17.5mt is expected to be completed by fiscal year 2019. 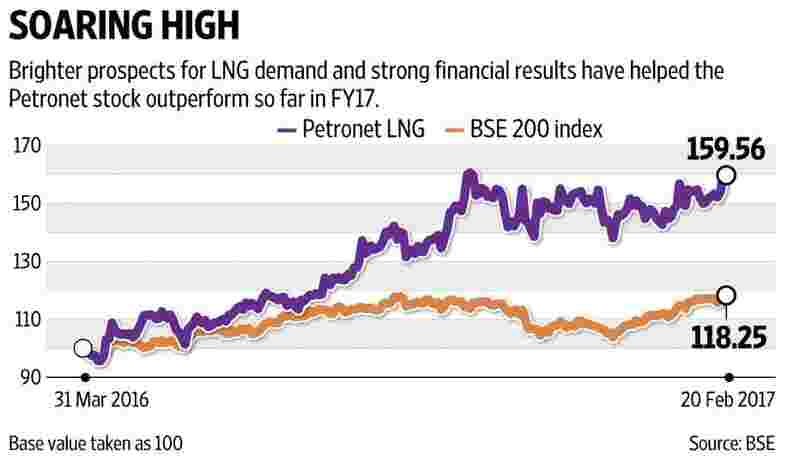 Shares of Petronet LNG Ltd have increased an impressive three-fifths so far this fiscal year. Shortage of domestically produced gas leading to better demand prospects for liquefied natural gas (LNG) is what has fundamentally propelled the company’s stock upwards. The LNG importer’s profit growth has been robust each quarter so far in fiscal year 2017 and the December quarter results are no exception. Net profit increased spectacularly, more than doubling compared to the same quarter last year to Rs397 crore. Operating profit increased 114% year-on-year to Rs607 crore. The Petronet LNG management told analysts in a conference call that the Dahej (Gujarat) capacity expansion to 15 million tonnes (from 10mt) was fully operational during the December quarter. The company said that the volume of 187 trillion British thermal units regasified at the Dahej terminal in December quarter is a marginal increase over the September quarter and a 36% increase over the December 2015 quarter. However, Petronet LNG’s Kochi (Kerala) terminal continues to operate at miserably low utilization levels—6% during the December quarter. Pipeline infrastructure problems have adversely affected utilization levels at the Kochi terminal and that has been a worry. “On the Kochi pipeline issue, Petronet LNG management shared that work on the first phase (Kochi-Mangalore pipeline) has started," point out analysts from IIFL Institutional Equities in a report on 15 February. According to the brokerage firm, once this line is complete, utilization of the Kochi terminal would increase to 40%. However, further ramp-up in utilization would depend on completion of Kochi-Bangalore, the second pipeline, which is likely to be completed only by 2019. Needless to say, developments on this front will be an important trigger for the stock. It helps that spot LNG prices are expected to remain subdued in the coming years on account of higher supply in global markets thanks to capacity additions. The Petronet LNG stock’s remarkable appreciation reflects that it captures this good news including the recent commissioning of expanded capacity. But further outperformance could be difficult. Incremental expansion at the Dahej terminal to 17.5mt is expected to be completed by fiscal year 2019. “Given we already assume further capacity expansion benefit of 2.5mmt with full utilization by FY19/FY20 and earnings growth post-FY20 would be minimal, we expect stock would be de-rated going forward," wrote analysts from Elara Securities (India) Pvt. Ltd in a report on 14 February. Currently, one Petronet LNG share trades at about 17 times estimated earnings for the next fiscal year based on Bloomberg data.